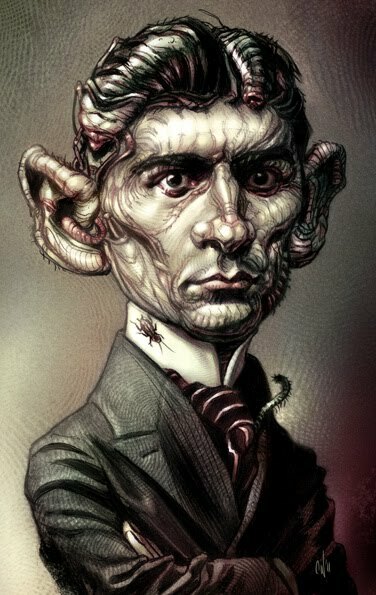 A caricature of famous writer, Franz Kafka. Considered one of the most important and influential writers of the twentieth century, most of his work only became published and celebrated after his death from Tuberculosis at age 40. One of his most well known tales, 'Metamorphosis', is about a man who awakens to find himself transformed into a giant insect. That was my inspiration for this caricature. If you look closely you'll notice I integrated bugs and bug parts to make up the features of his head. The parted hair is made up of two large roach-like creatures, his nose is the head and neck of a Praying Mantis and the shapes of the ears, the jaw and cheeks etc, are made from various creepy crawlies. I love looking at art with depth which keeps the viewer coming back for a second look. That's what I was aiming to achieve in this piece. This was a pencil drawing scanned and coloured in Photoshop. My custom fingerprint brush was used for the textures.